Wal-Mart is working with law enforcement officials to investigate a racial incident. Voice on Wal-Mart PA: "All blacks need to leave the store"
(CNN) -- Police in New Jersey arrested a teenager in connection with a public-address-system announcement telling "all blacks" to leave a Wal-Mart store, a police spokesman said. The 16-year-old boy is from Atlantic County, New Jersey, said deputy police chief John Dalesandro of the Washington Township Police Department. The suspect was arrested Friday in Atlantic County on bias intimidation and harassment charges, police said in a statement Saturday. He is in custody of his parents, police said. Gloucester County prosecutors say that shortly before 5 p.m. on March 14, an unidentified male accessed the public address system at the Turnersville, New Jersey, Wal-Mart Supercenter Store. "All blacks need to leave the store," the voice announced. Store management contacted the Washington Township Police Department, which opened an investigation in conjunction with the county prosecutor's office, Dalesandro said. Wal-Mart corporate spokesman Lorenzo Lopez said the company is "just as appalled by this as anyone." 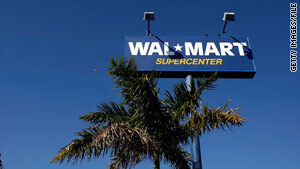 He emphasized that Wal-Mart, the world's largest public corporation, is working with law enforcement officials. "Whoever did this is wrong and acted in an inappropriate manner," Lopez said. "Clearly this is unacceptable." Law enforcement officials said that Wal-Mart is now acting to limit the public address feature to a smaller number of in-store telephones. Lopez has confirmed that the New Jersey store is updating its intercom systems and that the company is looking at Sunday's episode to see if there are any lessons for the retailer's other 4,000-plus American stores.